Global prosperity has grown since 2007, but countries grew at different rates and some even saw their prosperity decline. We can think of these changes in prosperity scores as countries moving up and down the Prosperity Steps. How do countries move up the Prosperity Steps? For example, India, which has a low prosperity score, scores well in Governance but poorly in Education. On the other hand, Azerbaijan, which also has a low prosperity score, scores well in Education but poorly in Governance. This is not the case for top performers in the Prosperity Index, where scores are high in every pillar. New Zealand, which enjoys the highest prosperity score, ranks among the top three countries in four of its pillars and among the top 20 in the remainder of its pillars. This has implications for the way in which countries climb up the Prosperity Steps. For countries at the lower end of the steps, improvements can be made in a wider range of areas. India can improve its Education score, while Azerbaijan can improve its Governance score. For countries already at the upper end of the steps, the options are more limited because their performance is already high. For these countries, the challenge is more a matter of maintaining prosperity than improving it. The chart illustrates how countries have climbed up the Prosperity Steps over the past decade. By splitting all 149 countries into quadrants, where the first quadrant contains the top 30 countries, the second countries ranked 31st to 75th, the next 76th to 119th, and the fourth quadrant the bottom 30 countries, we can plot the movement of countries up the steps. The chart shows that climbing up the steps, from one quadrant to another, is difficult. Between 2007 and 2016, only eleven countries did so. 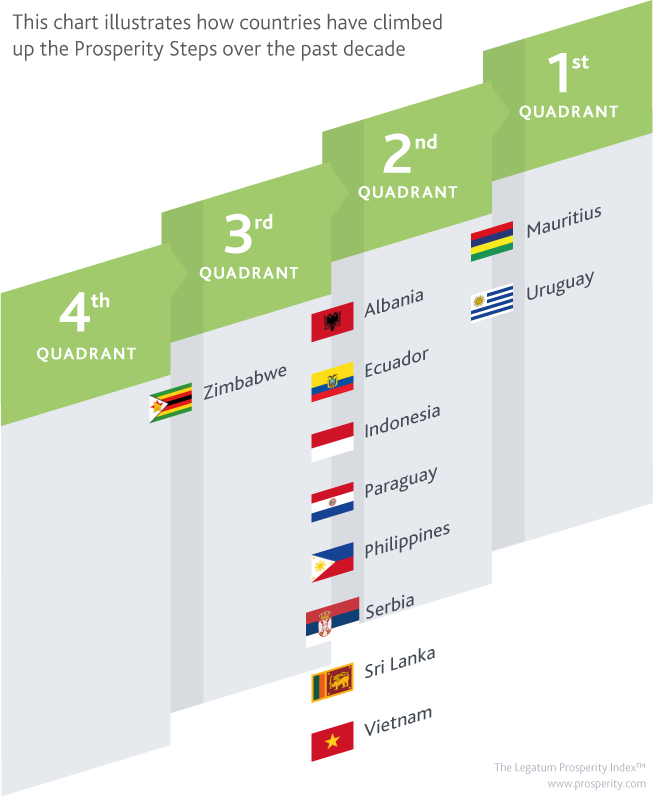 Two – Mauritius and Uruguay – climbed from the second quadrant to the first; eight – Vietnam, Albania, Paraguay, Serbia, Ecuador, Indonesia, Sri Lanka, and the Philippines – climbed from the third quadrant to the second; and only one – Zimbabwe – climbed from the fourth quadrant to the third. This shows us that mobility is higher in the middle of the steps: moving from the third quadrant to the second is easier than it is at the top or bottom. The Prosperity Steps also allow the identification of countries that, while not moving up or down the steps, are hovering around the threshold – that is, they are placed to either climb up or fall down the steps. For already prosperous countries like Italy, the challenge is to maintain prosperity by not letting performance in any pillar slip. The table below contains the countries that are just above or below the threshold between quadrants. This framework brings us back to the issue of improving and maintaining prosperity. For relatively less prosperous countries, like the UAE, the challenge is to improve performance in pillars where they are currently lagging behind. For already prosperous countries like Italy, the challenge is to maintain prosperity by not letting performance in any pillar slip.